A colleague and I were windowshopping in the city while waiting for our partners to finish their week's drudgery, when she mentioned they were thinking of having dinner at Yum Yum Peking Duck. The SO and I have driven past the restaurant several times with interest, but hadn't gotten round to checking it out. My colleague invited us to join them, an offer we didn't refuse. The restaurant wasn't very busy and my colleague had dropped by 20 mins earlier to make a reservation. We were directed to a table by their street-side window to peruse the menu. Peking duck is a very rare treat back home and while simple to put together on the dinner plate, the duck has to be cooked perfectly lest the flesh becomes dry and stringy, and the skin must be crispy. I wasn't sure what to expect, but was prepared for the worst. And once again, Australia has proven me wrong. As their name suggests, Peking duck is their specialty. 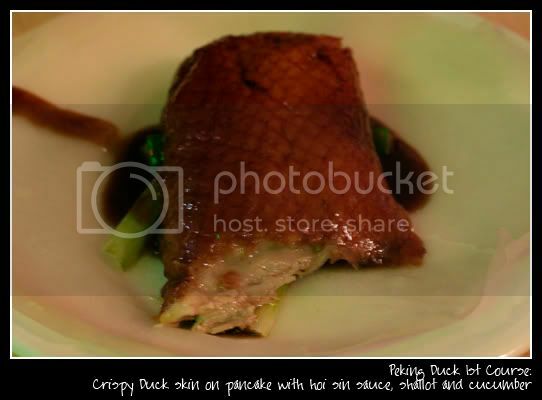 Host and owner, Frankie Yiu recommended their Peking 2 courses (AUD$ 55) - duck served the traditional style dressed with hoi sin sauce and shallot on a pancake skin and a choice between the san choy bow or the meat with plum sauce. Between the 4 of us, we got 10 serves of beautifully prepared Peking duck pancakes. The pancake skins were a tad dehydrated, but that might just be a consequence of the Aussie air this time of year is chilly and dry. The sauce and juicy duck skin more than made up for the pancake skin either way. 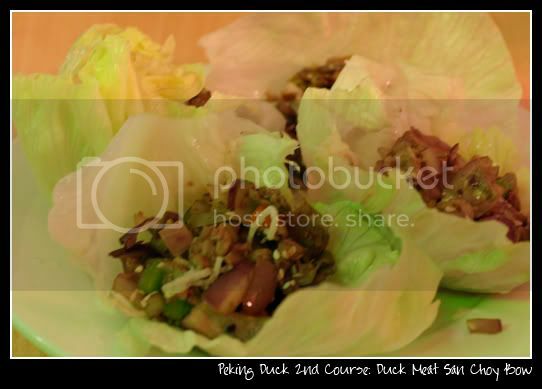 We chose to have the duck meat san choy bow: stir fried duck meat with diced red onion, capsicum and deep-fried vermicilli served in crisp lettuce leaves. We positively woofed down the 2 serves each. 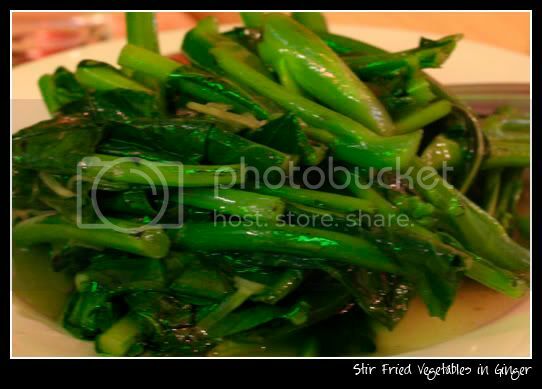 The Asian vegetables are offered in a choice between garlic, ginger or oyster sauce (AUD$12). Salted fish is also an option, but more expensive at AUD$14. 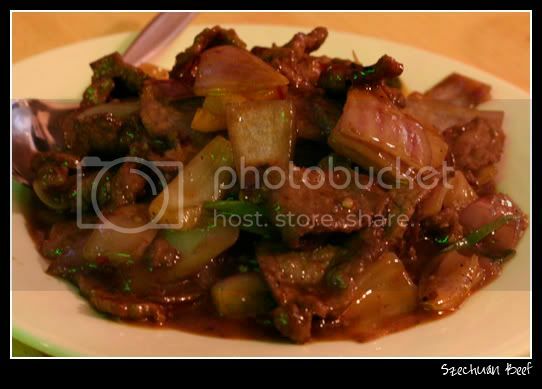 This was very well prepared, with the delicate flavour of ginger kept subtle and fresh. Szechuan beef (AUD14) was perfect and I was thrilled the chef did not dumb down the spice for the benefit of the Caucasian palate. The tingle of the chilli was more than enough to send little shivers of joy down my spine. Yum Yum Peking Duck restaurant has no ambience, with simple furnishings and little in the way of decor, save their happy fortune buddha statue and waving gold kitty at the counter. But do not let that put you off. The menu is also a little pricier for dishes, such as combination chow mein/hor fun (AUD$13) which you could quite easily get in a city Asian restaurant for $10-12. Steamed rice per person is also $3, which to me, was (O_O). Back home, rice would be an additional 50 cents, but... oh well. Unlike their original restaurant in Darra, we weren't asked to finish our meal in 45 mins and allowed to savour our meal at our own leisure. If you're looking for good Asian food in the city without the headache of parking, Yum Yum Peking Duck is a great option. That's ok. Duck isn't terribly popular, since they take longer to grow and there isn't as much meat per input as chicken. Can't you get peking duck at the asian restaurants there? Oh my YUM indeed! haha, brings back fond memories of the peking duck i had in Crystal Jade once. ;-; It was awesome. Oh! I never knew Crystal Jade served Peking duck. I loooooove their century egg congee... so simple, yet divinely delish. The Taka branch (the one at the basement) had this peking duck set for families. We had them wrapped in think pancakes too, and dipped with sauce. The skin was thinly crispy and the meat well roasted. *_* Ooh, I like their plain congee!! :D S$1.50 for a big bowl of yummy porridge. Even if it looks plain, it tastes amazing! It looks you had quite some treat at the Yum Yom Peking Duck. I can see now why it's called this way. What kind of restaurant equipment does one need to cook this specialty? Can if be found in any restaurant supply store? The Pecking duck looks great and I am sure it tastes ever greater. For the best peking duck, an air compressor is really handy. You slip it under the skin and pump air through to lift the skin off the flesh, allowing the fat to melt away during the roasting and giving that characteristically crispy skin. Not quite your everyday kitchen appliance.